I am not a coffee drinker by any means and so when I start to feel a chill in the air, I turn to tea, cider, and hot cocoa. I have loved this particular recipe for tea since I was a little girl. It's fragrant, fruity, and instant! It makes a really nice gift around the holidays in a decorative jar, too! Best of all it takes about 5 minutes to make and then you have stash of it for winter! There are only six ingredients and I have four of those just in my pantry. Other than that, you will need a canister of Tang or similar drink and lemon flavored instant tea. If desired, get tea that is decaf. The Tang is a nice way to get some extra Vitamin C, too! Goodness knows anyone who works in a school can use all the Vitamin C they can get! 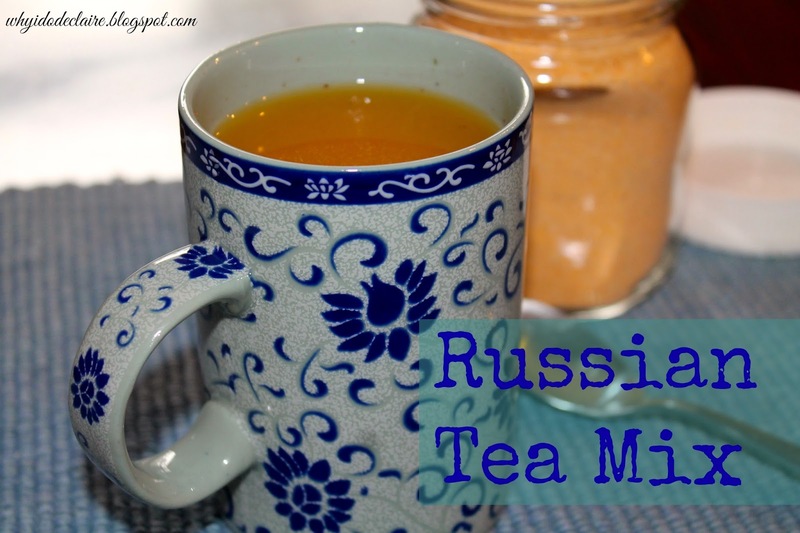 Russian Tea Mix 1 1lb, 2oz jar of Tang 3/4c. instant tea with lemon 1 1/2c. sugar 1t. ground cloves 1t. cinnamon 1/2 t. allspice Mix all ingredients and store in an airtight container. Stir 2-3t. of mix per cup of boiling water to taste. Enjoy! i've never had that but would love to try it and make some! This sounds yummy! I wasn't a coffee drinker until Maddox was about six months old, now I can't quit it! I probably should have never gotten myself hooked. Have a lovely weekend Laura! I'm not a tea drink. I can't get over the taste of it. Have a great weekend. I love a good cup of tea. This one sounds delicious ! I can definitely try this one out! Thanks for this recipe. I love tea and this is an interesting mix. I've never heard of this, but it sounds really tasty, and so simple! Nothing like a hot drink to cozy up with at night. I would never even think of this! This seems like a fun alternative to my usual english breakfast tea!